Promotional towels and bath robes, with embroidery or print. Let your customer's or prospect's day begin with a soft and cozy towel. This is not a privilege, but one of the basic human needs. And because of that, this is an excellent opportunity for your promotion. 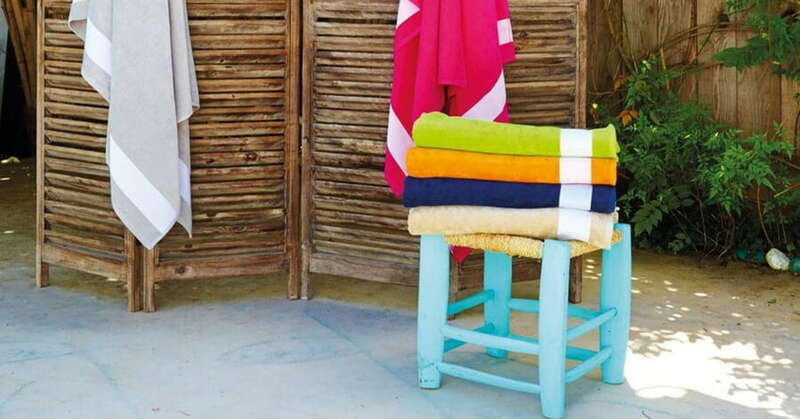 In our store, you will find all kinds of towels - from thick to thin, large and small and in all kinds of colors, which is an important factor when deciding, as colors strongly influence our mood. We use towels everywhere. They are a must have in our bathroom, kitchen, when we are active in sports activities or relaxing in a spa. If you combine usefulness in everyday life and an effective promotion, you have achieved the holy grail of promotional merchandise. A towel is definitely one of better tools to promote your brand or company. As soon as your promotional item enters the private life of your customers or prospects, the promotion was a success. As towels offer a substantial real estate for branding, they are on of the most suitable promotional items. A towel, printed with your artwork on the whole surface, with eye catching design, is sure to turn heads, either on the beach, spa or gym and thus achieving the desired effect of the promotion. These kind of orders have a longer delivery time, so be sure to request your quote early enough. We can of course print or embroidery a smaller logo on the towel quickly, while still keeping the towels a unique and useful promotional tool. Be especially mindful of the packaging you give the towels in. Let your imagination run free and impress your customers. If you need help with designs, our graphic department will be glad to offer assistance. You can easily request a quote for printed or embroidered towels or bath robes on the product page.